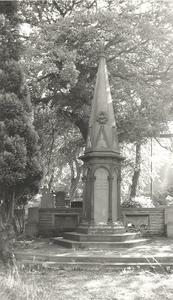 A hexagonal stone pillar with pyramidal top on a three-stepped base backed by a low wall bearing three plaques. The pillar is decorated and bears the inscription and names. Unknown date: Second World War tablets decaying slightly but still readable.